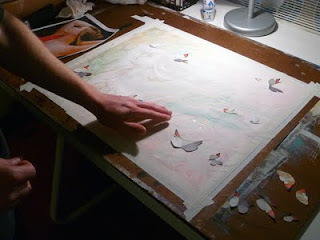 Blog of Sara (Butcher) Burrier :: Sara B Illustration: I am..
My current Work in Progress is one of great scale and testimony to myself. With the state fair right around the corner (work due June 17th) I knew I wanted to do something "special" just for it. I spent a day going through photographs and concept phrases. What am I going to paint?! The phrase "I am Eve" was my starting point. I am of Eve, she was the first woman, and I come from her. I am also fallen like she is. So I had to find an image that said "I am Eve". Once I found it, I sketched out my concept. 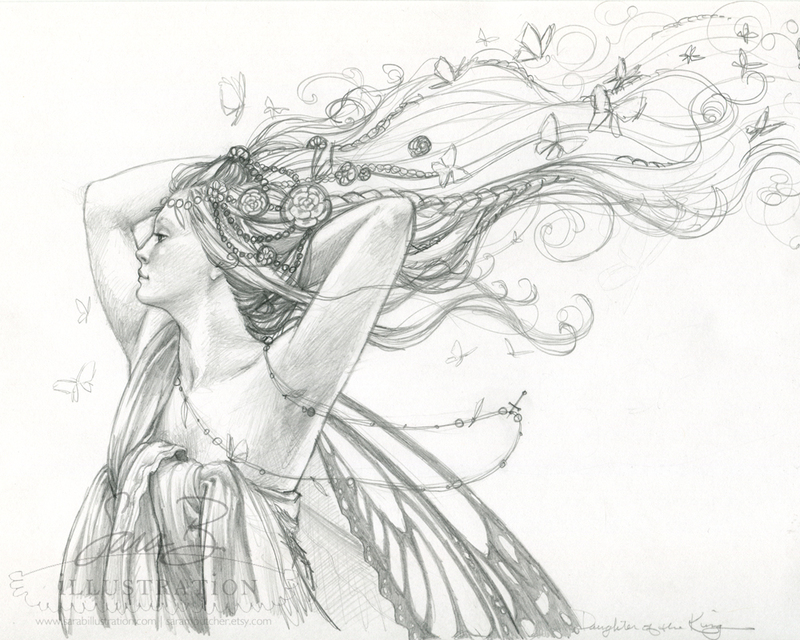 Concept Sketch "Daughter of the King"
As I sketched her out, the title changed. Although I am of Eve, that wasn't what was most important. That isn't the point. And that certainly isn't the end of the story as to who I am! The Spirit said I am more than that, I am more precious than just a daughter of Eve. I am the daughter of the most high KING. I am a daughter of God. I was ready to move onto the watercolor paper. A very scary task. I loved the sketch so much that I was actually afraid to go on, to try drawing the portrait again. I was also afraid her size would not be what I wanted or planned. 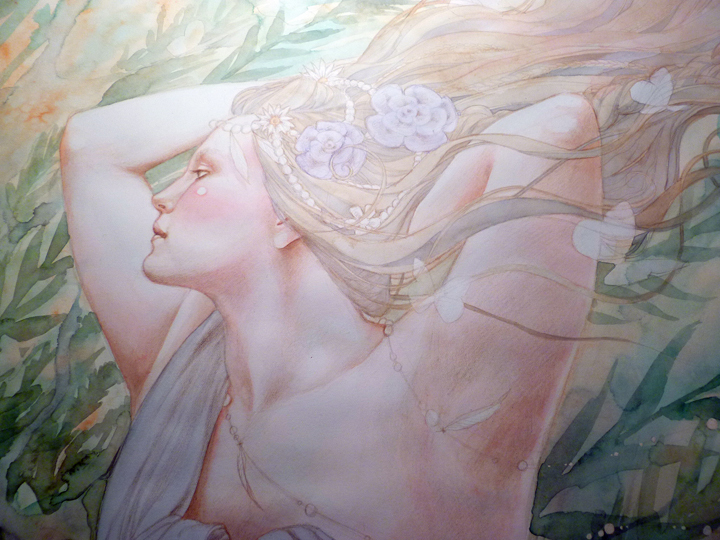 The paper was 20x16, and I wanted most of it to be play with watercolor. Which meant she wasn't to be too large. I was also preparing to draw in colored pencil only, so erasing was minimal. 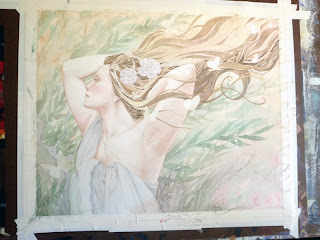 I started...worked so hard to make sure the emotion and spirit was there...that I didn't realize I drew her too big. :/ I prayed. 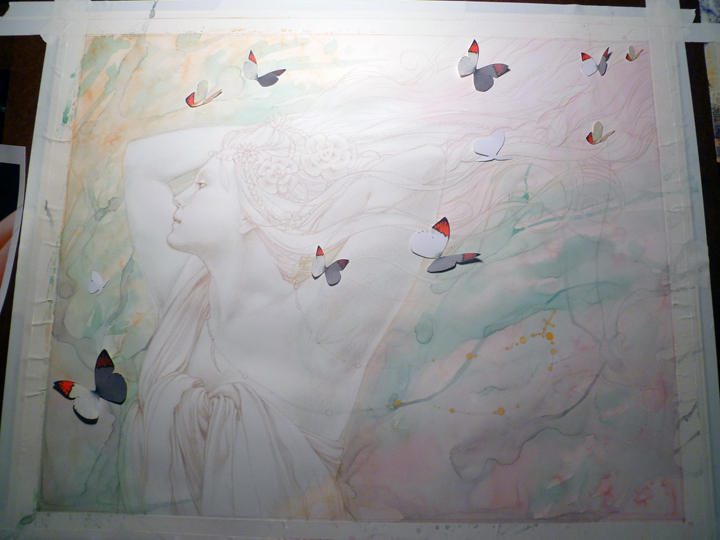 I had two choices: let this drawing go and start again (which meant buying another $10 sheet of watercolor paper); or continue on and work with the challenge presented to me. I always teach my students to problem solve when their piece doesn't go as they planned. Here's a perfect opportunity to practice what I preach. I also believed God was working with me. It was time to solve the background. I knew I wanted it to be loose, fun, and experimental. Garden like, and I had my colors already in mind. I used to squirt watercolor paint out of tubes onto large sheets of mat board then add water...allowing the paint to do what it wished. I wanted to do something similar but with a mature level of control and purpose. Once that was in place I had Brian come in to help me figure out the butterflies. He's awesome at composition and placement of objects! 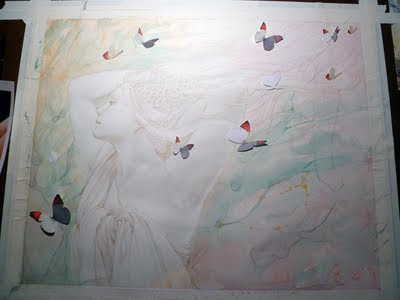 I traced my butterflies and began to add greens into the shadow areas of the skin. I wanted to switch my focus to the skin and face. 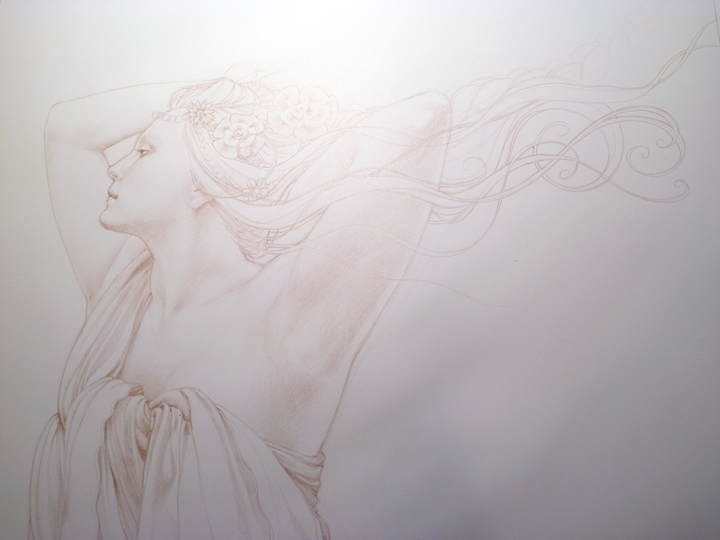 One of my biggest inspirations of all time, and to this day, is Mucha. I wanted this piece to reflect how much his work inspires mine. So the face is pretty important, as Mucha would put much attention to it and not the rest of the skin of the body. Nor the values of the clothes. This is where I am today. 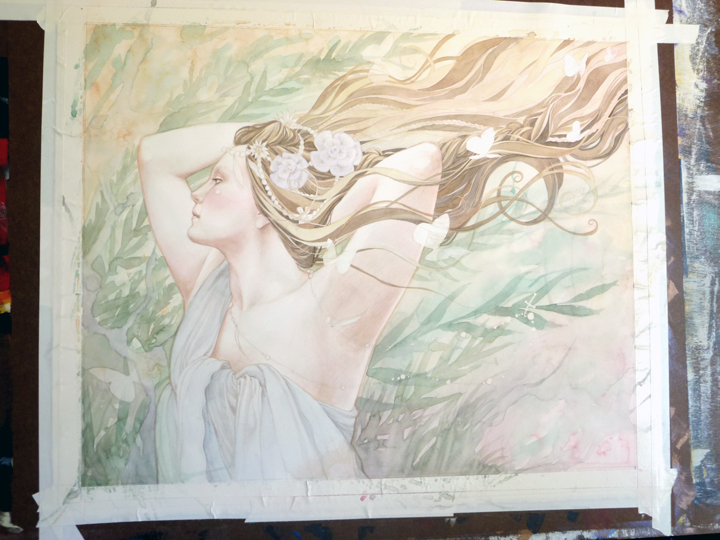 After working on the hair for a while I can now see that other areas of the piece need pushing. The fabric will be more navy as well as the tones in the skin. Stay tuned for more updates! P.S. "Where did the wings go?!" You ask...well...composition wise they didn't work since I ended up drawing her too large for the paper. 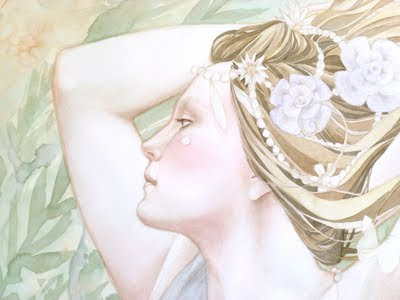 Also, fairy wings for me denote "Earthly" or "Eve", but the change of title...although I am earthly and human, I wanted to emphasize the relationship to the King. Sara, this is truly beautiful! I love it! You are so talented, and I love that you worked with what you had even when it wasn't going according to plan. That feels so appropriate for what this piece is representing! Absolutely beautiful work! I love it, it's so graceful. :) You're an incredible artist! Sara,a really beautiful painting, the difficulties you had were mean't to be to acheive this stunning painting you have done. and you know how to handle brushes as a Master. In fact, you are a Master! wow, this is so beautiful Sara! beautiful work !!! And thank you for sharing a step by step of your painting process with us !